Hines UK has appointed two contractors to undertake over £3 million of work at Birmingham’s landmark Brindleyplace estate. DP Designs and City Office Interiors have been appointed to deliver a series of significant improvements to common areas and vacant suites at Three and Four Brindleyplace. Meanwhile, City Office Interiors will undertake the refurbishment of the vacant fifth floor accommodation at Three Brindleyplace. A continuation of the investment programme that has already seen the £4 million transformation of the Oozells Building, the works will modernise and upgrade the spaces. Three Brindleyplace will benefit from upgraded lighting to the colonnade opening onto Central Square and new entrance doors leading into a refurbished and realigned central atrium. A light sculpture will sit above the new and repositioned reception desk leading into the fully refurbished lift lobby, with £1 million of the total due to be spent on improvements to the lift system alone. The building’s vacant 12,000 sq ft fifth floor office space will receive a full refurbishment to Grade A standard. Providing a class-leading office space, the works will include installation of plank ceilings, LED lights and raised floors. 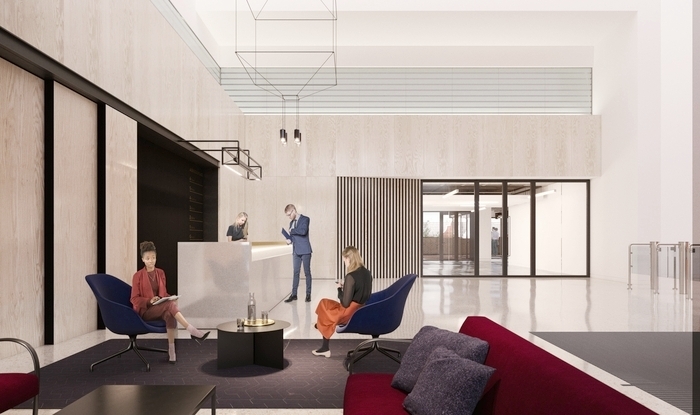 Four Brindleyplace will also see upgrades to its entrance and reception space, with a new and repositioned desk and visitor seating as well as improvements to finishes. The 5,000 sq ft ground floor office suite is being refurbished to provide Grade A standard offices which will feature contemporary exposed services, suspended LED light fittings and raised floors, alongside access to a private canalside terrace. James Campbell Adamson, Hines, said: “Brindleyplace is a unique proposition within Birmingham, offering the only fully managed commercial environment in the city. This location continues to be strengthened by the ongoing work taking place around it, such as the extension to the Midland Metro tram along Centenary Square and Broad Street.